In 2013, a scrap metal dealer from the American Midwest bought a gold egg for $14,000, with the intention of having it melted down and sold for a few hundred dollars’ profit. But no one would take him up on his offer: it was thought he’d paid too much for the egg and the ladies’ watch and jewels inside it. So he turned to the internet, and soon realised that he had stumbled upon the Third Imperial egg by Fabergé, a gift from Tsar Alexander III to his wife Maria at Easter 1887. Thanks to an anonymous collector, the scrap dealer’s few hundred dollars of profit turned into a share of a reported $33,000,000. This fabulous Fabergé find is just one of several remarkable tales told in Fabergé: A Life Of Its Own, a new documentary offering a thorough and fascinating account of one of art and culture’s most eminent and venerable names. The film, narrated by Samuel West, has won awards at festivals worldwide, and opens in cinemas on 29 June (more details at www.fabergefilm.com). From the peak of its fame and fortune, when it was the jeweller to the Russian royal family, to the leaner years when the name only appeared on lipsticks and bottles of aftershave, through to its recent rebirth led by Fabergé descendants alongside the original work’s appeal to a market of global collectors, few brands can have enjoyed, or endured, such a rollercoaster ride. The work of Peter Carl Fabergé, and the jewellery firm begun by his father, first came to the attention of the Russian royal family when Tsaritsa Maria — recipient of the Third Imperial egg — bought her husband a pair of Fabergé cufflinks. The patronage of the Tsars, who commissioned the legendary Imperial eggs as family Easter gifts, and gifted thousands of Fabergé items to dignitaries and dignitaries they visited, meant that in 1900, Peter Carl oversaw a firm of 300 craftsmen and workers, all housed in one St Petersburg building. 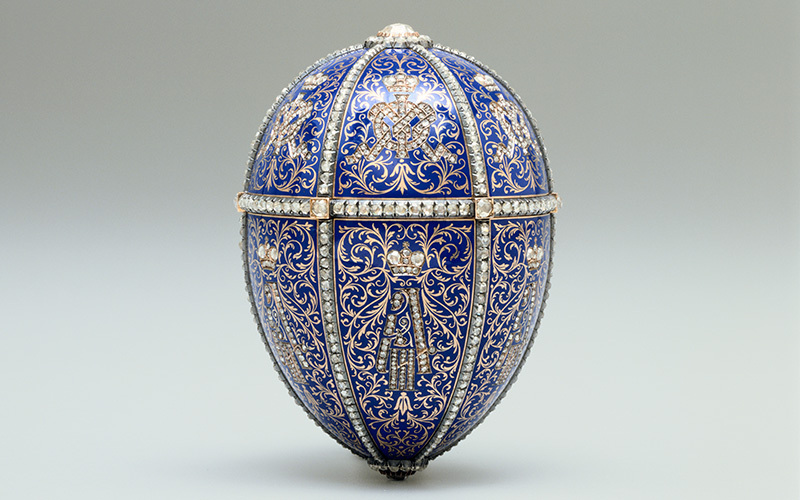 Along with the eggs and other items only available to the wealthiest in society, Fabergé also made smaller and more affordable items, but with the same attention to detail and wit. He allowed his best craftsmen, known as workmasters, to initial their works, thus creating sub-sets of Fabergé that would, in time, become catnip to collectors. In 1903, Fabergé opened his first London shop, at 173 Bond Street, but by 1914 began to lose his best craftsmen to World War I. Three years later, the Russian revolution halted production altogether; by this time it is estimated that the firm had produced 200,000 items, including 50 Imperial eggs. The Bolsheviks nationalised the House of Fabergé and Peter Carl fled, first to Finland and then Switzerland, where he died in 1920. His brother and son continued the family firm in Paris, but demand dwindled. An American cosmetics firm began to use the name Fabergé on its products in 1937. The Fabergé family launched a legal action, and were awarded $25,000 in 1951. In 1964, the Fabergé cosmetics firm was sold for $26,000,000, and in the 1970s boomed on the back of Brut aftershave and lines of shampoos and cosmetics. In 1991, after the company and its naming rights had been bought and sold several times, a contemporary Fabergé egg was made under licence to a German jeweller. In 2007, after more corporate wrangling, two of Peter Carl’s great-granddaughters joined forces to spearhead Fabergé Limited, which makes jewellery and pieces imbued with the original Fabergé ethos, many of which are egg-themed. As the Fabergé name and firm was undergoing its tumultuous transformations, works produced pre-1917 only became more collectible and desirable at auction. Two upcoming Christie’s sales on May 20 give collectors an opportunity to acquire Fabergé pieces that are new to the market. At London, King Street, From Roentgen To Fabergé: A European Private Collection has a dozen pieces, including a rarely seen silver gilt guilloché enamel thermometer from workmaster Viktor Aarne. A few hours later, at Rockefeller Plaza in New York, over two dozen Fabergé works of great stature and provenance will go under the hammer during the Russian Works of Art: Important Silver and Objects of Vertu sale. Of great interest among these items are a jewelled gold guilloché enamel photograph frame, with the workmaster’s mark of Michael Perchin. Along with Henry Wigström, Perchin is one of two master jewellers most associated with the making of Imperial eggs. 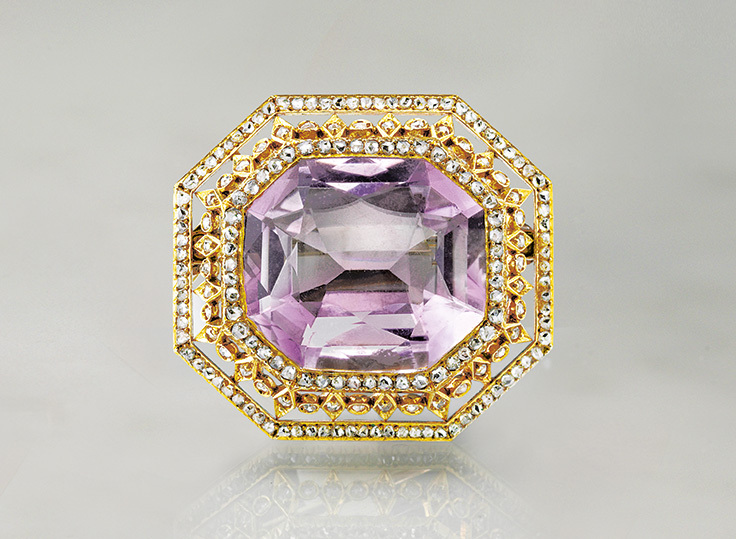 There is also a gold, amethyst and diamond brooch that has excited collectors. Fifteen of the Fabergé pieces in the New York sale are among 50 lots that are property from the descendants of Grand Duke George Mikhailovich, the grandson of Emperor Nicholas I. The Grand Duke’s wife and two daughters were summering in England when World War I broke out; they never returned to Russia. Grand Duke George was executed by a Bolshevik firing squad in 1919. The two young princesses, Nina and Xenia, grew up to marry and eventually settle with their families in the United States. The path of exile for many Russian royal family members led to the United States, and when they could, they brought their most prized possessions with them — the Third Imperial egg among them. (Seven Imperial eggs are still unaccounted for.) 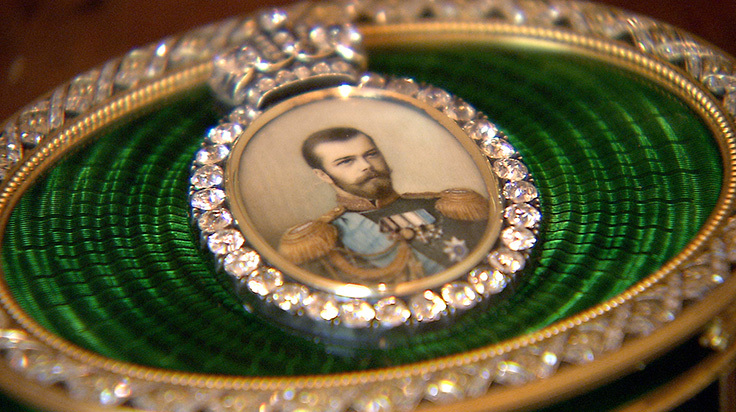 The story of Fabergé, as recounted by the documentary and the pieces themselves, is as seductive as the work. 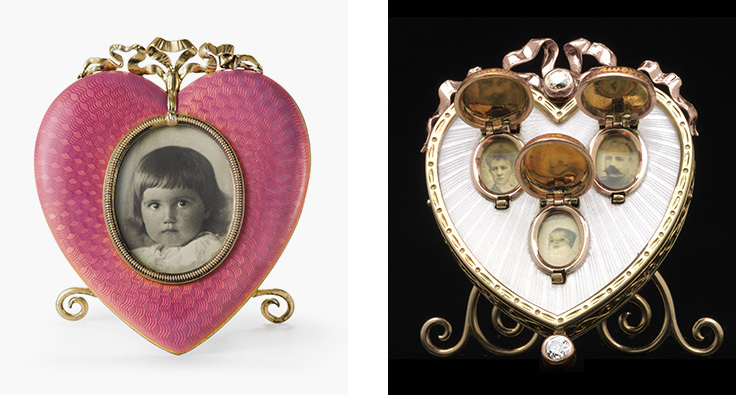 ‘You think of very good quality when you think of Faberge, beautiful objects that are largely functional,’ says Moehrke. 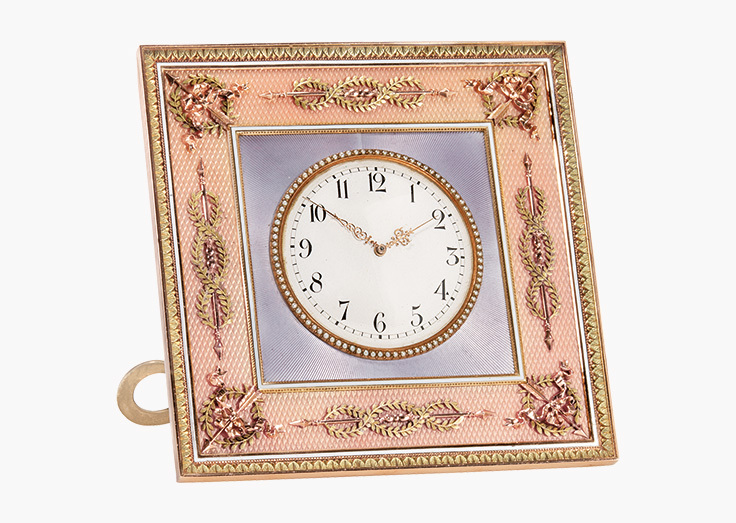 ‘They reached such a level of perfection, especially with the guilloché enamel work, that it just can’t be replicated. But seasoned collectors also love the hunt, the detective work that goes into it: looking at inventories, the records of Fabergé in the state archives in Russia.